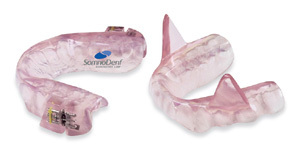 Dr. Tripp uses a highly effective solution, the SomnoDent MAS, for the majority of patients suffering from Obstructive Sleep Apnea. Its exceptional levels of patient acceptance and compliance as well as treatment efficacy are backed by a large body of clinical research. The dentist will thoroughly examine your teeth and mouth and may use X-rays to confirm your oral health status, as well as ensuring that you are dentally appropriate for the splint. Dental impressions are required to fabricate a SomnoDent MAS. They are then sent to our laboratory where the appliance is made. Once custom made for you, the appliance will be fitted by Dr. Tripp who will show you how to insert and remove it yourself, as well as how to clean and care for it.